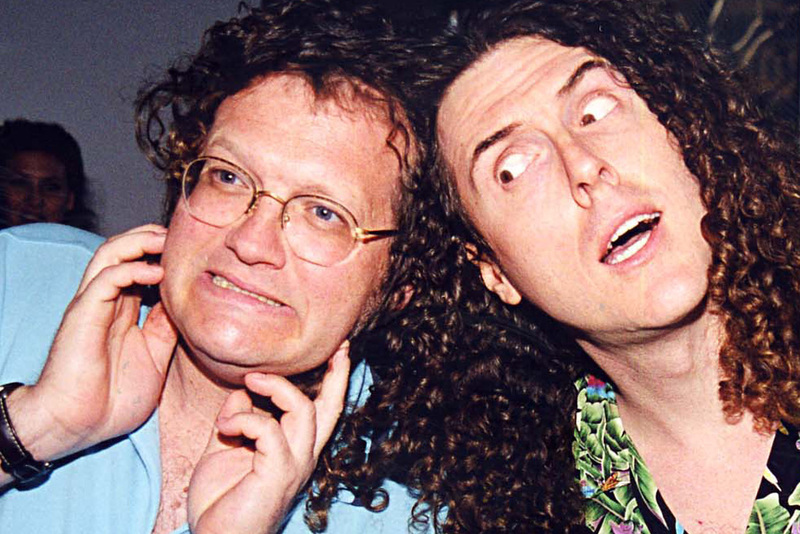 Another memorable 2001 moment came thanks to comedian Drew Carey. The host of Whose Line Is It Anyway and star of The Drew Carey Show had no business getting in the ring, but did anyway. He stood there and watched the Hardy Boyz eliminate each other, which seemed easy enough. For a shining moment, Carey was the last man standing. Then Kane stepped out of the tunnel and confronted the actor. The imposing wrestler grabbed Carey by the throat and looked ready to end him. Out of nowhere, Raven appeared and saved Carey, who fled from the ring and eliminated himself. Up next, the incredible Royal Rumble debut of Tye Dillinger! Tye Dillinger was a staple on NXT and was long overdue to make his Smackdown debut in 2017. Obsessed with the number ten, WWE thought it would be a great idea to have him debut early during Royal Rumble as the tenth competitor. Dillinger’s gimmick only took him so far, though. 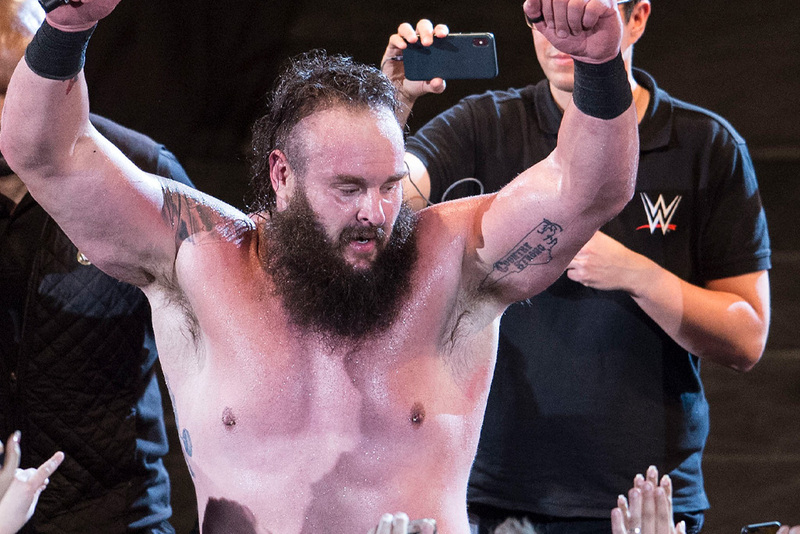 Once he entered the ring, he faced off against Braun Strowman (pictured above). 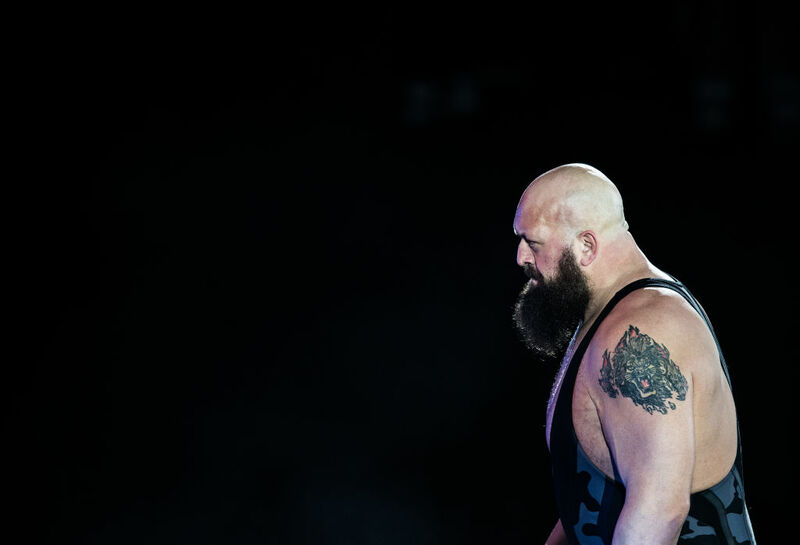 The bout didn’t last very long as Strowman took care of business within minutes. Still, the unexpected match could have lasted mere seconds, so Dillinger had that in his favor. The year 1996 brought a lot of intrigue to Royal Rumble. Other wrestlers weren’t quite sure what to expect when Jake Roberts entered the ring with a large bag over his shoulder. They lost their minds when his larger than life python slithered out. 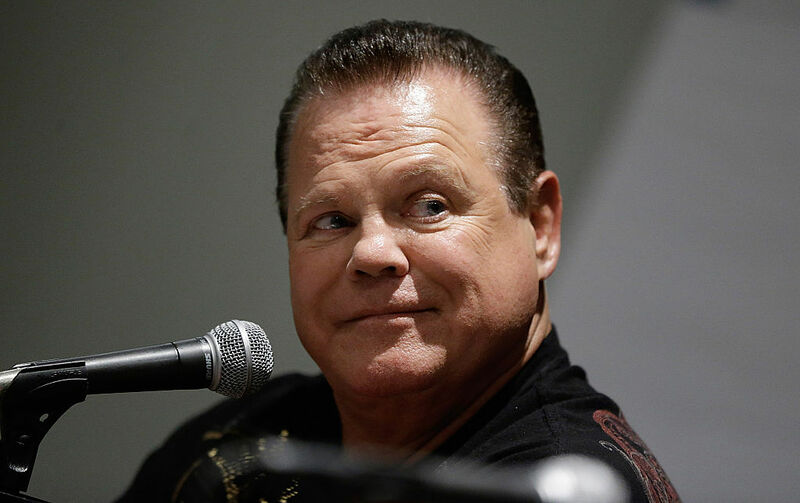 Named Revelations, the snake cleared the ring of everyone except Jerry Lawler, who was distracted with Henry Goodwin in the corner. Roberts grabbed Lawler, tossed him into the middle of the ring, and put Revelations on top of him. Lawler freaked out and scuttled his way out of the ring admitting defeat. On the next slide, Randy Orton takes down WWE’s biggest heel! Fans were tired of Roman Reigns dominance by Royal Rumble 2017. WWE had a problem on their hands and needed to find a way to deal with it. To solve the problem, they booked Roman Reigns as number 30 on the rumble fight card. Near the end of the event, Reigns appeared and beat the Undertaker and Chris Jericho. Fans were outraged. Beating Jericho meant the WWE star was set-up to win another Royal Rumble. Then Randy Orton entered the ring and took down the heel. 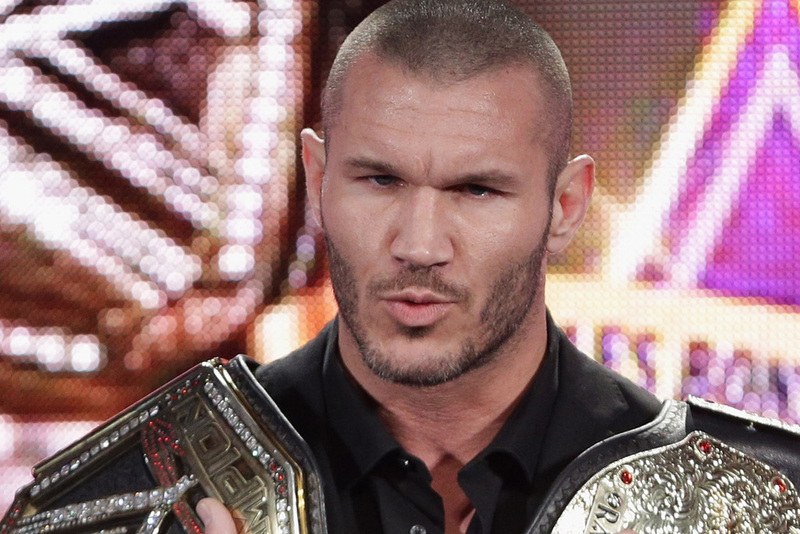 It was Orton’s second career Royal Rumble title. Few WWE superstars were as groundbreaking as Chyna. In 1999, she became the first female ever on the main card at Royal Rumble. She was given spot number 30, and the made the most of her mixed-gender opportunity. Her only victim was Mark Henry. Chyna was upset that he claimed they had been intimate together on their first day and took him down. What happened next blindsided her. She turned around and was face to face with “Stone Cold” Steve Austin. He clotheslined her, eliminating her from title contention. 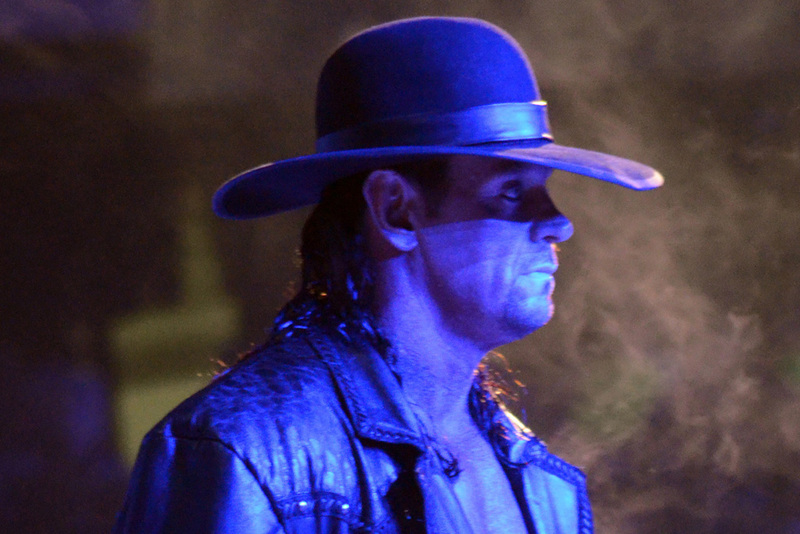 Coming up, the Undertaker makes his presence known! The WWE landscape was changed forever when the Undertaker made his presence known at Royal Rumble in 1991. The organization was high on their new wrestler and wanted to give him a big fight to leave an impression. That happened when he took on the entire Legion of Doom. Things looked bleak at first. The team cornered the Undertaker and held him against the ropes. Seemingly out of it, he came to life and strangled both Hawk and Animal. His sheer strength and power was incredible. After a quick struggle, the duo somehow broke free and knocked the wrestler over the ropes. WWE Royal Rumble 1990 was an instant classic. 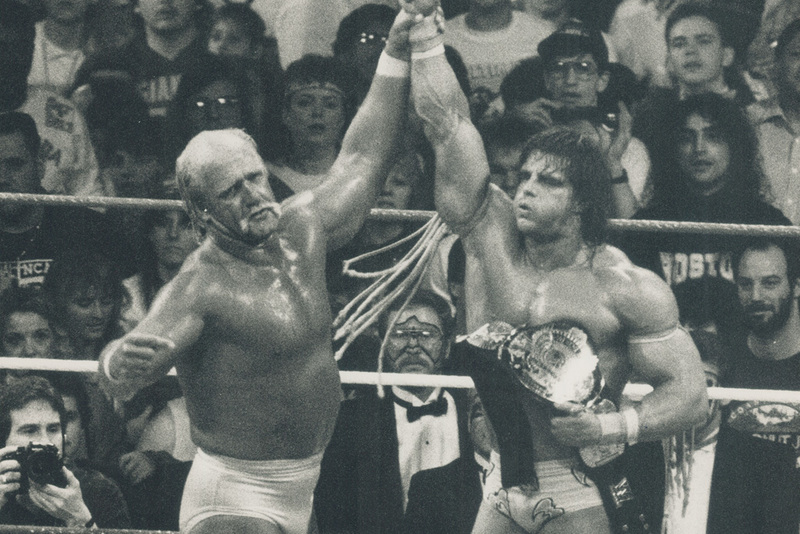 The feature match was a blast to watch, and came down to the sport’s two most popular wrestlers; Hulk Hogan and the Ultimate Warrior. Realizing they only had each other left, the two men stared each other down while the crowd waited for the first blow. It was one of the first fights of the era where two men who didn’t hate each other were forced to fight. They locked bodies and traded blows. In the end, they knocked each other out of the ring, leaving the Royal Rumble with no winner. 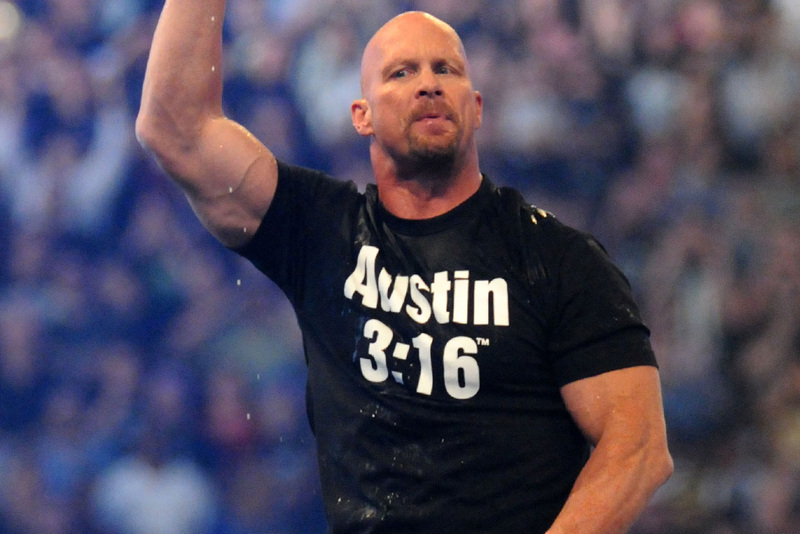 Perhaps no Royal Rumble was more jaw dropping than “Stone Cold” Steve Austin’s from 1997. He was the fifth of thirty wrestlers to enter the ring, and the last man standing in the field. It’s not just how long he lasted that is so impressive, though, it’s also about how many wrestlers he knocked out to win. In total, Austin eliminated ten wrestlers from the rumble, a record at the time. The last man he had to beat was Bret Hart, who was hanging on the ropes celebrating (he thought he had won) when Austin came up from behind and pushed him out of the ring. 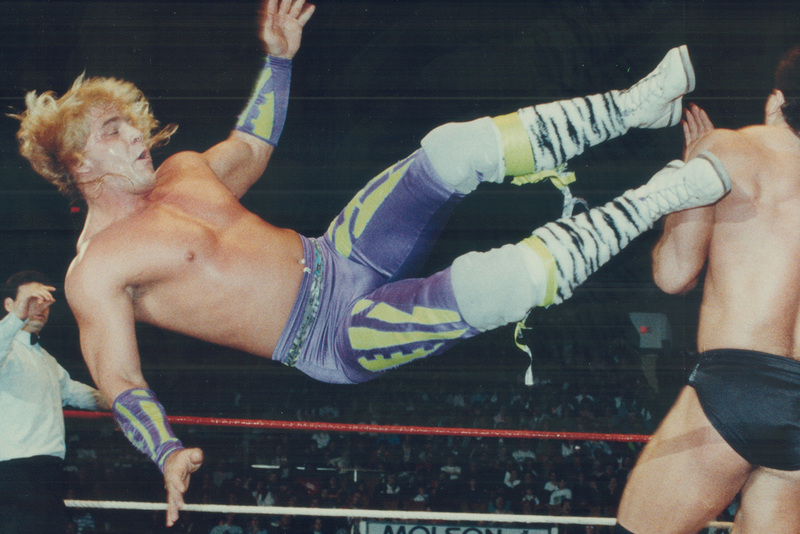 Still ahead, we relive the time Shawn Michaels’ foot saved him from elimination! The 1995 edition of Royal Rumble featured an unrivaled ending that needed to be seen over and over again to be believed. 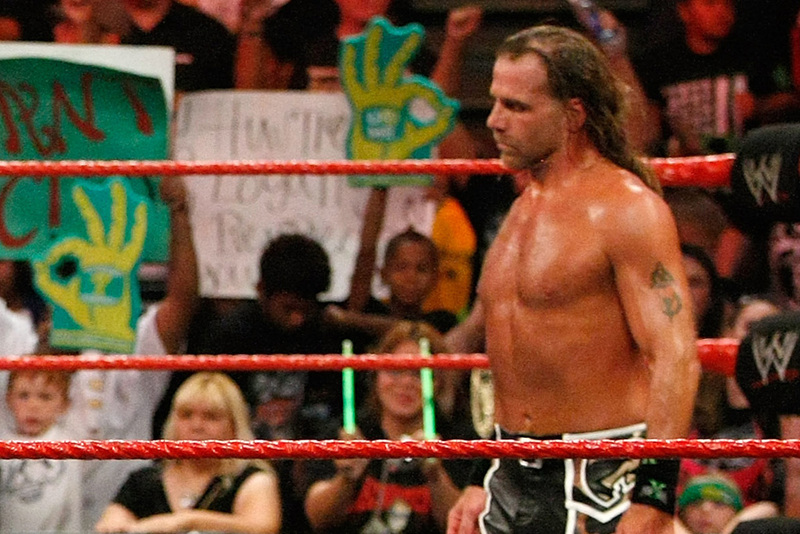 Shawn Michaels was the first wrestler to enter the ring, and outlasted every single wrestler, finding himself alone with the British Bulldog at the end. The Bulldog clotheslined Michaels over the ropes and began celebrating. Michaels then attacked him from behind and knocked him out, winning the match. Replay showed that although Michaels was knocked out, he grabbed the rope and only one foot hit the ground, not the required two, meaning he was still in the match. Shawn Michaels made history again at Royal Rumble in 2010, but it wasn’t the history he wanted to make. After losing the title match at Wrestlemania to the Undertaker, Michaels planned to use the Royal Rumble as a way to force a rematch. It was smooth sailing for Michaels’ at first. He was a man on a mission. Then Batista forced him out of the ring. Michaels was shell shocked. He casually re-entered the ring and was told he had to leave by a ref. He knocked the ref out then fell to his knees unable to process his shattered dreams. On the next slide, we reveal another close call that turned one wrestler in Spider-Man! Fans couldn’t believe their eyes in 2011 when Morrison was knocked out of the ring but wasn’t eliminated from the Royal Rumble. The wrestler flew out of the ring and grabbed onto the barricade refusing to let his feet touch the floor. 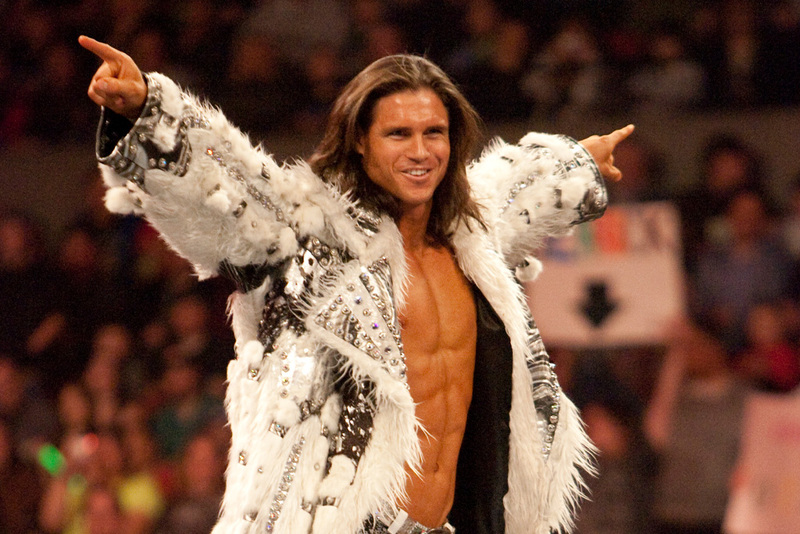 Morrison used his parkour skills to wow the audience and fly his way back into the ring. He ended up being eliminated later, but still created the highlight of the year. Without question his Spider-Man style save is one of the greatest individual moments in Royal Rumble history. Almost immediately, Lawler was knocked back over the top rope. He stumbled back to the announcers’ table and said, “to know a king.” As the match continued, Lawler acted as if he didn’t remember the incident at all. John Cena was supposed to be a non-factor at Royal Rumble in 2008. He was recovering from a pectoral injury and was barely supposed to be ready for Wrestlemania the next month. Cena couldn’t wait though, and snuck his way into being the 30th billed wrestler on the card. Triple H thought his road to the title would be easy until he heard Cena’s entrance music start playing. The surprise appearance meant Triple H would have to take down John Cena and Batista to win. That didn’t happen. Injury and all, Cena pulled out out the incredible and unlikely win. Coming up, AJ Styles returns to WWE in… style! 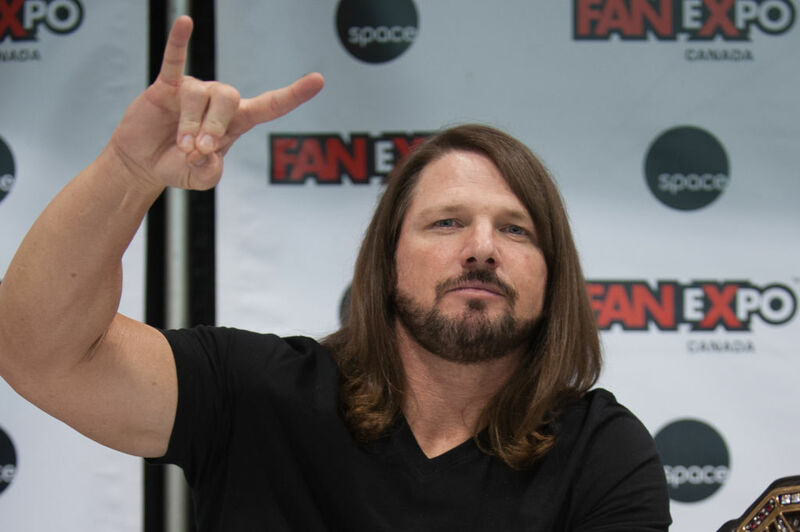 AJ Styles had been out of WWE for a long time when he returned in 2016. To many, it was their introduction to Styles, and it couldn’t have come on a bigger stage. Styles was given a one-on-one match with Roman Reigns at Royal Rumble. Fans knew the wrestler had re-signed with the company, but few knew just how big a deal WWE was going to make of it. They also thought he would come out as a new character. Sometimes what’s old can be new again, though, and Styles proved that he didn’t need to reinvent himself. The year was 2004. 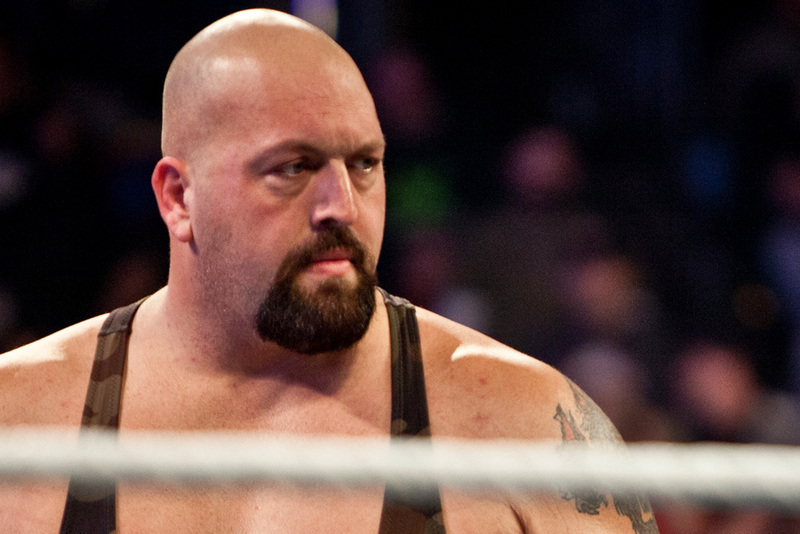 Big Show was putting on a show at Royal Rumble and was considered the favorite to win it all. Together with him in the ring were Christ Benoit, Rob Van Dam, John Cena, Chris Jericho, and Kurt Angle. The wrestlers banded together in an effort to take down Big Show. They all unleashed their finishers, but nothing worked. One by one they were eliminated until only Benoit was left. Big Show picked him up, but Benoit was able to counter with a guillotine choke and drop him out for the victory. Here’s one ending no one saw coming. 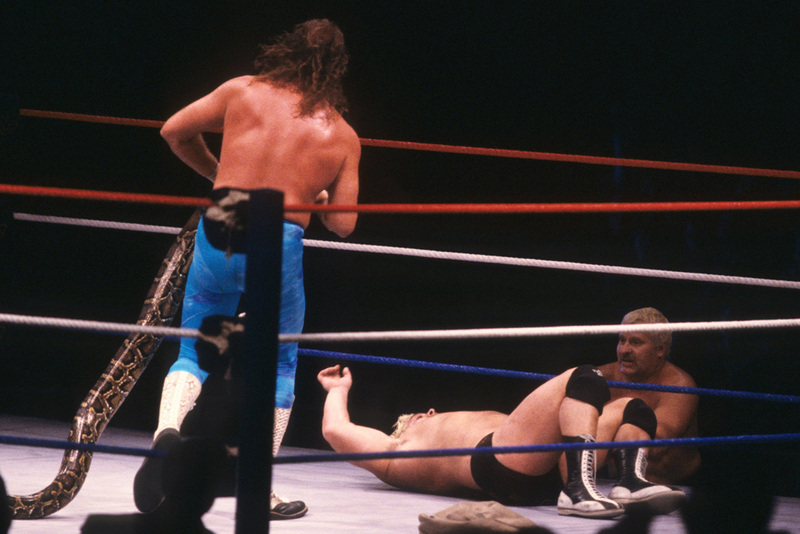 Shawn Michaels was the last man standing in the ring with Yokozuna and Vader in 1996. Before taking each other on, the behemoths should have taken out the much smaller Michaels. Instead, they turned on each other. Michaels waited and watch the Godzilla versus King Kong battle until just the right moment. Yokozuna managed to get Vader up against the ropes when Michaels jumped into the fray. He pushed both of them over the ropes, knocking them both out simultaneously and taking the crown. There was plenty of drama during the 2002 Royal Rumble event. The Undertaker was in his “biker phase” and on an unstoppable path. The Hardy brothers had a grudge against him and entered the ring with a plan. It didn’t work. The Undertaker easily knocked them out of the ring. Then Maven came out, but before the Undertaker could take him out, the Hardys re-entered the ring. As the Undertaker took care of them, Maven came up and dropkicked him out of the ring. 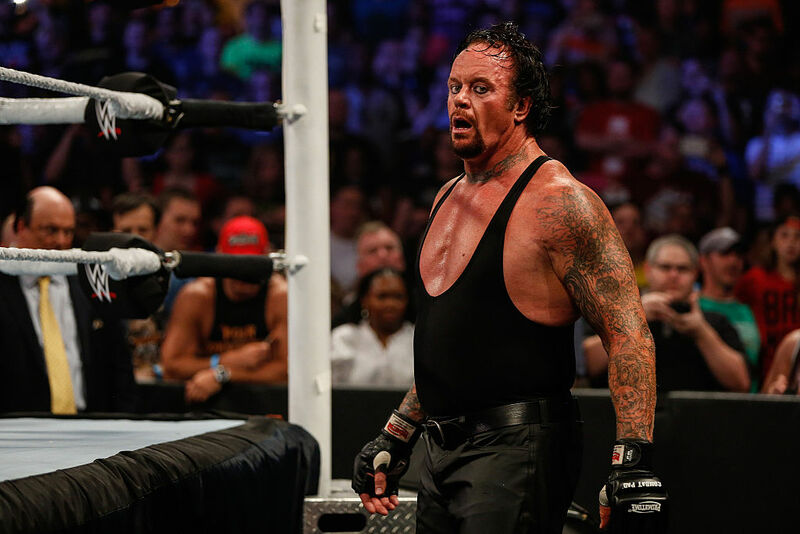 Upset at losing, the Undertaker re-entered the ring and beat Maven up to an inch of his life. The rematch between Brock Lesnar and Bill Goldberg was a long time coming. At Survivor Series the two faced off, but the fight was short lived. Goldberg took down Lesnar in under two minutes. The unexpected rematch during Royal Rumble in 2017 was brilliant. Brock Lesnar salivated when he saw Bill Goldberg enter the ring. He knew he was ready for revenge. Then Goldberg speared him, then clotheslined him, forcing him out of the ring. It was fast, brutal, and everything fans wanted. It was the highlight of the event. The second year of Royal Rumble was one of WWE’s best and most creative. Ax and Smasher, known together as Demolition, were the first and second billed fighters. They both came out and had no choice but to fight each other until the third billed wrestler appeared. Despite being teammates and partners, they went after each other relentlessly. Fans were overjoyed at the sight of Ax and Smasher turning on each other. After beating each silly for a while, Andre the Giants finally appeared, allowing Demolition to reform and fight as one unit again.